Want your Monday morning laugh? 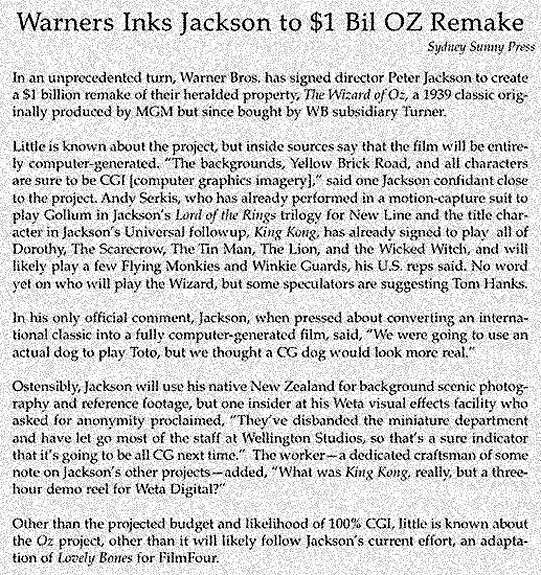 Check out this absurd and denied rumor about Peter Jackson remaking WIZARD OF OZ! Ahoy, squirts! Quint here. This rumor is so stupidly retarded funny that I couldn't help but share, especially since it was printed by a newspaper and I've had it personally denied as a "witless" lump of BS by Wingnut Films. Here's the article... let's see how many absurdities we can find? Is there an Australian April Fools-type holiday I don't know about? One Billion Dollars? Completely CG? Andy Serkis as everybody... including Dorothy and the Wicked Witch? Could this get any funnier? So, before it starts, that rumor is KO'd 100%. I've seen these things start with a little BS item ran in some small paper and turned into actual fact as it's repeated across the internet. Not gonna happen.